If you have a large number of modules displayed in the My Courses list on the Welcome page, or in the Course List on the Modules page, it is possible to edit which are listed. gear icon that appears in the top right hand corner. 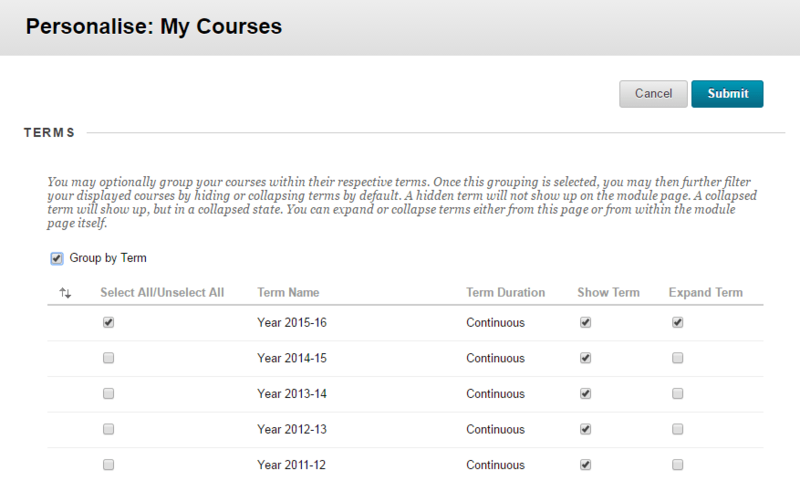 This gives you a number of options regarding how the list of your courses is displayed. Tick Group by Term and Blackboard courses will be grouped per academic year. Untick this, and all the Blackboard courses associated with this term will be hidden from your Welcome Page. If this is ticked, then all the Blackboard courses associated with this term will be collapsed on your Welcome Page, and you will need to click the title to expand. Consider using this to reduce clutter on your welcome page, but still give you easy access to previous content. Untick the Course Name boxes of the courses you wish to remove from the Course List and press submit. You may also drag and drop a course to reorder the list of courses by using the drag handles on the left hand column.